POLITICS ? Latest report as Rev. Fr. Ejike Mbaka has described the man he supported openly to become president in 2015, Muhammadu Buhari, as one who is caged. 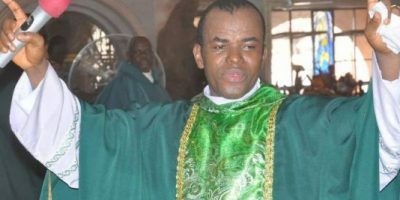 It is reported that Mbaka, the spiritual director of Adoration Ministry, Enugu, said this during an exclusive chat with the publisher of SaharaReporters and 2019 presidential aspirant, Omoyele Sowore. ?Buhari meant well for the country but I can see Buhari as a man whose ideologies has been kidnapped, I can see somebody that is bemused, I can see a man that is confused, I can see Buhari in spite of his goodwill he has some people around him that has no ideology that is in tandem with his,? he said in parts. ?When I was telling Jonathan and Co, they can?t come back instead of believing, they started attacking me and God says the chair is vacant Buhari will take over, I never knew who Buhari was. They accused me of being sponsored by Buhari and God knows until now Buhari has never given me One Kobo. ?Am not against his leadership because he has not given me anything, am only unhappy with him because he doesn?t want to make necessary changes. ?The much I know about Buhari is he meant well, but it?s too unfortunate that he is caged by people who are not telling him the truth.? ?I?m asked to advise you, don?t come out for the second tenure; after this, and retire peacefully. Come back to yourself or you will cry by the time you will be sent out of office. Those who are encouraging you to come out and run again want to disgrace you shamefully and publicly. ?The country needs change, as I said Buhari is a good man but because of a lot of factors around him, those around him are not telling him the truth, even when they tell him the truth and he gives orders they go and mutilate it and tell him that everybody is happy and that everything is moving well. ?We need God to give us someone after his own heart, who can emancipate Nigeria, because Nigeria is the heart of Africa, is the hub of Africa forget about South Africa or whatever she is doing. Nigeria is Africa because when Nigeria is good, Africa is good. ?